It would be nice for each section if there were a parts list also with a picture. That way you’d know that you have all the parts before starting. Also, the white washers in this step are pretty easy to overlook. inside the bag wiht the idler+bearing and shaft, there where also one tiny set-screw, where does that belong? Hi Asbjorn, it’s the spare screw for bondtech gears. I only had one pulley bearing that came in the little baggie, and need another in order to move on to the next steps. I also did not have a pulley shaft. Is there a way to get those two pieces? Never mind. I did not realize that the two bondtech pulleys would look similar. My pulley bearing and pulley shaft were inside one of the bondtech pulleys, so it looked as if the three separate pieces were one single piece. There are no differences that you should be aware of. You can even print that part from PLA if needed. Hi Ravish, that’s correct, you may be in a wrong manual altogether. Look for the MK3S assembly manual, if you have the latest printer model. I would suggest doing this part after the pulley so the nuts don't fall out while trying to get the pulls in place. Hi Gary, last time i tried on 5 different pieces the nut traps were quite tight. Your were loose? Similar for me - until step 15 (where I’m now), I must have chased and reinserted these two nuts at least half a dozen times. I’d also recommend to leave them in the bag until step 16. It is true that these nuts tend to fall out, we do recommend to double check for their presence before starting the step 16. I put them in and they easily fell out, so I took two #10 bolts and screwed them in temporarily. The shaft did not slide easily for me. I ended up putting it in a small vice to slowly and carefully squeeze the shaft into the idler. The shaft was flush with the inside idler support, but only through the first side (wasn't in the outside support at all). I used an M3x10 in the vice to push the shaft through until it was evenly inserted into both supports. Gabe’s comment is extremely important as he had the foresight to make sure it was evenly into both supports. My printer died after 13.5 hours of printing because I did not realize the shaft had not entered the second support. The gear spun very easily even under decent force but when pushed on hard enough, the shaft/support bent and allowed the gear teeth to contact the plastic. This put load on the extruder motor which I believe lead to burning out the power supply. My printer can no longer warm up without the power supply cutting out. I don’t have a vise, but i was able to use a pair of adjustable pliers (vise grip) to do a similar type thing, using a M3x10 to push the rod evenly into both supports. Thanks for the tip. I observed the same thing. The pin seems to be about 3mm too short. The hole was too tight to press fit for the 3 mm shaft, so I needed to carefully ream the hole with a #31/ 3 mm/ 0.120” drill bit. Yes, well done, I recommend being proactive and very carefully clearing/enlarging the holes with the 3 mm drill bit. Yes, that is correct, the shaft is not supposed to be flush on either side, it just has to sit firmly in both holes. Well… F, I finally broke a part. Didn’t have a drill, vise grips, or vice. Tried to align the shaft and slowly add more pressure and the first loop/hole snapped off. Does anyone have the .stl for this part? Nevermind, I found the file on Prusa’s website. Another case where I got the part started - in fact, got it all the way in, and then used an aligning punch and a few light taps from a hammer. An aligning punch is like a center punch, except it has a blunt end, and is perfect for this application. Was able to get the axle in and perfectly centered in the holes. I concur that the 3mm rod seemed too short and a slightly longer rod would go a long way to easy assembly with the tools provided. i was able to use a 3mm bolt with a pair of large adjustable pliers to adjust the pin to have good engagement on both sides. ALTERNATIVELY: I did not try this, but inserting the rod from the opposite side (top side, narrow side, side with the gear teeth) until flush would likely provide an acceptable engagement in both ends. I reamed the holes with a 3mm drill bit and replaced the original 18mm long pin with a 24mm one. The new pin is almost flush with the outside of each mounting block. I liked this better than trying to center the short pin. You can find ground and polished pins on Amazon. Used the back of the screwdriver while resting the piece against a flat surface to get the shaft pushed down most of the way, then just pushed the pin a bit more with the other end of the screwdriver till it was even on both sides. Not pretty but got the job done. No way that shaft was going in, and I’m not a hammer as a first option kind of guy so I took a drill bit by hand and worked it in and out for a few minutes, then it went in snug. Like many other parts in this build the tolerances are far too tight for this piece, was pushing it in very slowly and it still broke. It is rather frustrating to have to order a replacement part an put my build on hold for days while it arrives. I do not have access to another 3d printer to print the part myself from the STL/gcode. The press fit of the pulley shaft into the Extruder-idler was very tight. I used a round diamond needle file to slightly ream out the idler holes and the shaft then inserted smoothly while remaining snug. Wow, this build is a challenge (fun). What worked for me was using a small hammer to tap it in, whil holding an M3x10 right above the part to focus the force (and protect the printed part). Very glad I read these comments all the way through. Used a 3mm drill bit by hand to enlarge the holes and then carefully inserted the pin and centred it by pushing it back and forward with a small Allen key. i measured the hole at 2.9mm , i used a round needle file to slightly file some material out until it was a neat press fit in then placed the bearings inside the bondtech and carefully located it and pushed the shaft through making sure it had the same landing on both sides by measuring the depth from both sides and adjusting it accordingly . i definitely recommend some lengthy breaks after every few steps in this amazing build. A little bit of lubricant helped in my case. First time poster here. Enjoying this, my first build. I found the holes were too tight and the alignment of the grain made me nervous so I went with a microfile and VERY gently filed the interior of both holes. VERY gently. Still a snug fit but I was able to get in and align evenly with one of the wrenches. Thanks for all the advice ya’ll!!! I only had standard bits, which were either a bit too small or too big. I reamed one hole and then continue pushing thru and started the second one, but only went half way thru. Then I used a bolt to push the scrap through. The pin is slides easily through the fully reamed hole, but the unfinished part of the second hole provides grip. Used a small allen wrench on push the bolt thru a bot more. This process would be alot better if the pin where longer. We’ll see if it works. I needed to use a vise and a bold to press the pin in. The pin seems too short, could have been longer so it was flush on both sides. Thanks for the tip Gabe. I ended up using an M3 and a woodworking clamp. By the way, if you don’t have a caliper small enough to check if the position of the pin is even on both supports use an M3 with a nut threaded onto it. Insert the nut into the hole and screw the nut down till it meets the part. Pull it out and lay it on top of the part to see exactly how far the pin is positioned. Do the same on the other side. Being uber-cautious, I enlarged the pin holes by twisting a .116 drill bit between my fingers. The holes got large enough that the tension on the pin was almost too low, After centering the pin, I added a small dab of hi-temp RTV silicon in each end of the pin holes to insure the pin stayed in place. Followed Gabe’s advice and used a small vise, tightening it ever so slowly. It was tight enough that the part would flex a tiny bit before the pin would advance into the hole. The piece stayed whole though and was able to center it with one of the longer M3s. This was the hardest step of the build so far. This was the hardest step so far. I used a 0.015” feeler gauge to take up any axial space so I could push the rod in with a vice without stressing the first ear. Another 1 or 2mm of rod length would be nice. Also slide the nuts in last so they aren’t falling out while you fiddle with the shaft. I was able to get in using the lip of my desk/work bench while hold the part(s) from falling and breaking. I probably should have checked the comments here, I broke the same part various others have. The shaft simply does not go into the holes. If I had known this online manual had a comments section I probably would have checked it first, especially when I was struggling. As it is, I’m now waiting on a response from support, as I don’t have an alternative printer or know anybody with one around here. That said, I’d say as many people as there are complaining about this, I think the part needs some re-designing…badly. Update….. I got a response from customer support. They sent me both the idler and the rod, no charge. I do indeed agree that the rod is too short. I used a C-Clamp to get the rod into the idler without much issue, didn’t have to clean the hole or anything. I then used a screw and hammer to get the rod further in so it is evenly between the 2 sides. +1 for Gabe’s vise and screw method. Worked well for me although I was nervous with each turn of the vise. Thanks for sharing Gabe! In the pic, show the screw on its side to show the length releative to the nut. There are a number of screws in this chapter. May be a dumb question, but how to handle the filament sensor without touching it? with gloves? just the edge? or use tweezers? My filament sensor mirror looks dirty coming string out of the sealed packaged. Should I be concerned? You can always clean it with canned air. Hex nuts did not fit at all, had to use square nuts unlike in picture. They are hex holes, hex nuts fit in perfect. How did you get square nuts in a hex hole? It’s very difficult to know if the nuts are “all the way in”. I thought I had them both in all the way, but when I put a screw in from the other side, I found that one was good but the other had a lot more depth left in the hole. May as well always pull them in with a screw. I used an M3x10 screw and threaded the M3n on the end about a quarter way through the nut. Then, I used the screw to manually place the nut into position, wiggle it down gently, and then backed off the screw out of the nut. This was better than tweezers or trying to fight the nut to go flat and into position. SUGGESTION FOR FUTURE MANUAL UPDATE: I had some difficulty getting the nuts (both hex and square) inserted at the correct angle. I hit upon a easy solution that is almost foolproof. Insert a longer M3 screw in the hole on the opposite side, use one long enough to “stick out” the other side. Then thread the nut onto this screw. Then spin the screw to “pull” the nut into the hole. Just screw it in far enough that it begins to get snug, then back the screw out and set the screw aside. Voila, perfect alignment every time. This is almost what we recomment at most steps where inserting the nut can be problematic. Thanks worked like a champ! There was no need for any force whatsoever. In fact, if I tilt the extruder body, the filament sensor falls out. Hope this is a big, “Nothing to see here, folks. Move along,” moment. Oh, and Happy Holidays! Thanks for the picture, I would have not tightened it down that much. Oh dear, I just got to step 41 and I realized the filament sensor in step 9 is loose. How tight should it be? Once the wire is attached to it there’s not much movement but there is some. Should I disassemble the extruder from step 41 and redo everything? You should be able to tighten the sensor without disassembling the extruder. These pictures in Step 11 are not enough. You need more. ANOTHER MANUAL UPDATE SUGGESTION. I initially started the assembly process using the tools provided. I quickly found the provided needle nose pliers to be a bit large and not always helpful. My hands are large and the tiny parts are sometimes hard to hold. The small parts tend to “squirt” out of my grip like a wet bar of soap. I used a pair of “reverse” commercial tweezers to pick up and hold the very small parts. Reverse tweezers must be squeezed to OPEN, when released they automatically hold the part. I used these on many stages of the assembly process, but they were especially handy when placing the little nylon washers. A small bright flashlight is another “tool” that came in handy. Parts can squirt away in all directions and usually end up on the floor somewhere HARD TO FIND. A good bright flashlight is immensely helpful trying to track down these runaway parts. THANKS FOR THE SPARE PARTS BAG. I had to resort to it several times for parts that went missing due to my own clumsiness. That’s correct - it will hold the extruder motor later. It might be nice to show this assembly from 2 different angles to make it clear what you are doing. It is hard to tell from the two existing pictures. I thought of it like Bill was saying. Basically if you position the filament sensor downwards (being careful not to put any pressure on it), then insert the screw upwards, then put the washer on the screw, then put the idler on, then put the 2nd washer on, then you are done. So maybe a picture from that angle, looking down onto the stack of screw -> washer -> idler -> washer. Make sure to check all the pictures during and after that step - it should help if you’re confused. We’ll see if we can add more pictures to this step. I was surprised that the lock screw was not already screwed it. On the other hand, I found out why we need a 1.5mm key. Hello Gregory, thank you for this remark, we’ll discuss this and see if we can do something with this. The grub screw is first set on the flat part of the stepper motor shaft as noted in the instructions. When you do the final adjustment, make sure the grub screw stays on the flat part of the shaft, else it will protrude too far out of the bondtech drive gear pulley and this will prevent the shaft from turning. As a test: Once you have done the final adjustment, rotate the shaft using the end of a small allen key or some other method to rotate the stepper motor shaft. 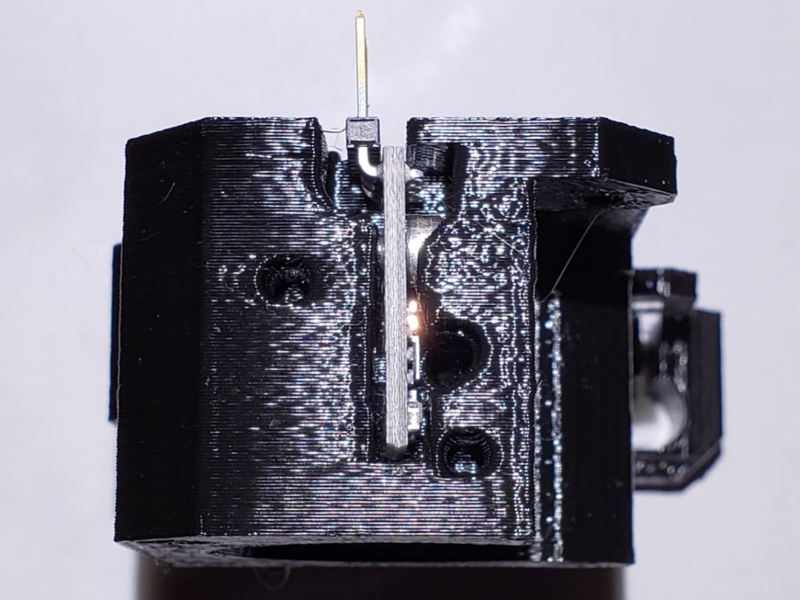 If the shaft does not rotate at this point because the grub screw catches onto the 3D printed part, resolve it now as it will cause filament feed failure when you do the first powered-up tests. My screw stripped out on the pulley before it was on the motor shaft. I don’t think the bondteck pulley was fully tapped, the set screw wouldn’t even touch the motor shaft when it stripped. Have you tried using some other key or bit to tighten the screw? Perhaps torx bit will help. If it won’t, please contact our customer support via info@prusa3d.com or Livechat. That nut on this is crap. Really need to work on getting a better one in there. Having a spare is nice, but if you strip the original, you are hosed. Considering what this part does, it really should be a more robust design and materials. Fix it. The designs, materials or coatings can change with everything. What you’re looking at is improved gear design that has new type of coating. You can loosen the belt and try to remove the pulley, but I’m afraid there is no other easy workaround. It seems odd to leave at the top like that by just eyeballing it. Would appreciate some sort of depth gauge to measure how far off the top of the shaft the top of the pulley should be. After doing Step 15, it makes sense to just eyeball it. Maybe add a note here that it will be adjusted further in Step 15. My bond tech pully didn’t have a screw in it. Turns out the screw is in the same bag and very tiny. When putting in the motor, before you start tightening the screws, check that the pulley on the motor shaft is approximately in the position shown in step 15. On my first attempt, the plastic parts inside the extruder pushed the pulley against the motor and then blocked it there - no movement of any kind possible. I had to unscrew the motor again, pull out the pulley and then tighten the motor screws again. I tightened the motor on and then noticed the translucent washer had fallen off. Loosened all screws just enough so that I could sneak the washer back in place, and then tightened everything up. Keep an eye out for that washer - it’s important and falls off easily if you don’t pay attention. Yes, that is exactly what Jakub meant, Thank you for your remark, we will correct the sentence. There should be a spare grub screw in the bag nr. 9. Not sure what the alignment center is. The red arrows cover the image. What is perfect alignment? What is the filament centered on? Over the set screw or center on the small groves to the left of the set screw? On the small groves, it’s the teeth that grab the filament and feed it into the hotend. Perfect alignment is when the filament is moving through the knurled channels smoothly - that’s how the filament feed works. Keep the screws just tight enough to move the filament back and forth, but loose enough to shift the pulley to get alignment. Tighten. Then push the filament back and forth - it will require some effort, but you should be able to see it moving centered in both knurled channels. Why does the motor have a white rectangle on it? Is this I am supposed to have done? It’s just a sticker that comes with the printer. You don’t need to add it. To help make it so that we are only messing with that crappy set screw once is to have a jig for step 13 that would be shaped like a nut with a small diameter peg to fit into the shaft space and a wider base to set the depth. Put it on the end of the gear and it would space the gear better and hopefully make it so that maybe most people won’t have to mess with the set screw again. It would be nice to say that the filament inserts into the hole directly above the filament sensor. It does not go into the idler holes. Also would be good to note that (I assume) that the pulley is now in its final position. The screw closest to the motor does not secure on the other side. The hole is too large and does not fasten to it. I may need to stop installation until I get this resolved. The parts are B7. - check you haven’t lost one (or both) of the square nuts you inserted into the slots back up in step 4. The screw should grab the nuts, not the plastic. If you have the right screw length and aren’t missing a nut, I’d suggest you check if the threads on both the screw and the nut are ok, and otherwise replace them from the spare bag. Hi Trent, yes, Markus is absolutely correct, usually it is the square nuts that fall away from the Extruder Idler (the door-like part). See the step 4 in this guide. Make sure you screw these in from the side that doesn’t have the door (or the gear visible through the hole)! It’s very easy to get this flipped and get the screws stuck before you realize it’s incorrect. Then you may have to destroy the idler door to get them out again. I did this and had to have a friend re-print the part, and I just ran into someone else with the same mistake. Brian, I made the same mistake, putting the spring screws in backwards. They got jammed. What happens is that the slots for the square nuts end up stripping and the nuts turn with the screw … Disaster, the screws are stuck. Hoe tighten is tighten? I mean because of the spring(s) the screw Will stick out! Is This ok ok or not? Idler screw heads are supposed to stick out slightly. Please see the first point in our video below on how to adjust them properly. this video really helped me figure how it should be setup. Why what Brian said isn't a large warning is beyond me. Very easy mistake to make that bricks the whole part. Now I gotta order a spare part. Make sure the the 2 gears mesh together before tightening. That idler door with the two translucent washers and then the two M40 bolts with the springs is such a sweet design. Well done Prusa. A check for perfect bolt tension on the idler door is to pick up the extruder unit in both hands, then orientate/rotate the extruder unit in your hands until your left thumb nail is pressing on the left M40 bolt head and your right thumb nail is pressing on the right M40 bolt head, place your right forefingers on the body of the extruder motor taking care not to obstruct the idler door being able to open out from the closed position, now press gentle with both thumb nail on the m40 bolt heads, you should feel pressure on both thumb nails and at the same time see the idler door open out from the extruder 1-2mm and then return back into position when you release the pressure with your thumb nails. If you cant get the idler door to open/move outwards it would indicate that you have the bolts too tight, loosen a little and repeat. I just saw that I forgot to put in the nut closer to the motor (or it fell out). Now the printer is finished, and I left the screw away since otherwise it would fall out. Is it worth / necessary to disassemble? What are the springs for? Ok, nothing had to be dismounted - just open screw(s) and the lid and then put in the nut. Still I would be interested whether that springs are affecting the printing quality. The springs are important, as they affect the idler and tension/grip on the filament. Make sure both are tightened properly. Has the hotend already been properly tightened from the factory by heating it up and tightening it, or do I need to heat it up and tighten it before installation. I also just received my I3 MK3 on December14, 2018. It does not have the mentioned green dot. I am disappointed because, I will most assuredly, be getting the MMU in the near future. This means I either have to change the PTFE tube now, or do it later. Since this is my first 3D printer I will opt to make the change later. It just seems safer. But, an annoyance! Hi Peter, I will check with our production team. However, the change isn't that complicated, though I understand your frustration. Well, I just had to get into this area and re-seat the E3D hotend. I was having trouble getting my z axis to set. Also, the wizard would give me an error each time at the z-axis. So, you guys told me that I need the extruder to be in deeper (I think that is what he meant). But, to get to the point of my comment, I then looked at this piece more carefully and noticed there was a dot on it. I am colorblind, so I asked my wife to look at it. YES! it is a green dot!. So, I rec’d the green dot. My comment then, to be helpful, is just a colored dot is not enough information for ALL OF US. LOL Some of us have challenges. Thank you for suggestion. We will try to improve this part. I don’t have a green dot, but my PTFE tube is 4mm by 50mm and seems to be to teh MMU spec, but frankly, that ‘guide’ that Andy links to above to really confusing. Maybe if the spent more time making it clearer rather than warning that it isn’t clear. Of course, for me this would be a moot point if MMUs weren’t running 3+ weeks late. Is the hotend, heatblock, and nozzle already tightened up while hot from the factory. Or do I need to heat it up and tighten everything before installation? Hi, this is a good question, but no worries, the hotend assembly is already tightened. If it would be needed to heat it up and tighten, it would be mentioned in the manual. Really important that the hot end go in here…it will actually assemble ok (and look okay) if it isn’t pushed in, but at the end of the build journey it will not calibrate and not print. I thought I was careful but goofed here and had to take the extruded apart to fix this. “Push the black collet in. Slide the tube all the way in and hold it! But that verbiage isn’t here and I don’t see it in general instructions for the E3D v6 hot ends? Is that an MMU thing? It’s not important at this step, as the hotend was already pre-assembled. If you re-assembled it, then please follow MMU instructions on how to push the collet. It took more force than I thought I would need, but since the tube is PTFE and flexible, it went in OK. It seems like the hotend front should be almost touching the printed part and all of the “coils” should also be inside of the lip (towards the back) of the printed part. I also managed to not seat the hotend deep enough, only to be discovered when failing XYZ calibration much later. Figuring out how to rectify that without totally unwinding all the steps was some serious edutainment. I know it’s stated here what needs to happen, but I think it would be way more clear if there were a lateral view really showing how the hotend is properly positioned. And/or clarification that the the ‘collar’ on this part and the next really needs to go between the ridges on the hotend. This is something that’s completely obvious once you understand how it works—but for neophytes struggling through the steps without ever having seen the finished thing, it can be cryptic. Especially since the hotend *seems* to fit in ‘just right’ when it’s placed not deep enough. Oh I totally agree and am chagrined that I could miss the mistake. Only the fact that others here and on the forum managed to make the same error leads me to think further clarification could help—because I agree it’s glaringly obvious—now. I think a full side view complete with a red X ‘no’ by a picture of partial insertion and a green ‘good’ by full insertion would really be worth it. Or at least a red comment about ‘If hotend is not fully inserted to proper depth, you can fully assemble the printer only to discover it won’t work’. The insidious thing is that when you say “correct orientation of the hot end” it’s not clear what axis you are talking about. I saw the warnings and was very careful to make sure the wires were on the correct side of the unit—after all the other warning is about wires too, so that seemed like the issue. The insertion depth didn’t SEEM to be tricky as it just fit right in (incompletely…) and so there was nothing prodding me to read the comments. Regarding the third picture, the right M3x25 screw does not reach any nut for me... I guess this means it simply taps a thread into the plastic, and that’s it, right? NVM, I just had to use a M30 screw to reach for the hex nut that I put there in step 6 and pull it all the way into the hole, it simply was not seated properly. Hi Francesco, good approach with the longer screw. Just don't forget to replace it back to the M3x25. No Jacub, M3x25 are too short. Screws should be longer. Make sure your nut is seated way down in the pocket. Zooming the 3rd picture results in the second picture being zoomed. Agree with Bill on this one - I thought you had to reach both nuts inserted in previous step. This comment saved me from contacting support with the same issue. Thanks! until i got to this part in the instructions, hah. My Noctua fan is black :). It has no rubber dampeners though. My Fan is also black to with out any dampeners……. Remove the zip tie that is closest to the heater block. Otherwise, it will impinge against the frame and cause an x-axis length error during first self-test. Hello Guy, actually it is not necessary to remove that zip tie, just make sure it doesn’t slide to a position where it would impede the x-axis movement. The M3x18 screws thread into the plastic which creates quite a lot of torque feedback… difficult to tell when they bottom out. I had to go real slow and toward the end wiggled the fan while tightening until all movement stopped. Seems like a lot of screw for a little fan. Could they be shorter? The instructions should highlight the routing of the extruder motor wires, directing the assembler to ensure they feed through the channel next to the fan. What you mentioned is visible on the first picture. Someone might look over this design, once I finished the section (E-Axis assembly) I noticed the nozzle-fan-45deg sits at an angle (<3-4 degrees) not level with the print bed. if there was a second screw that would provide more support. Already in there from a previous step? There is no way to push it in from the side. Hi, Matthew, can you be more specific? Which part were you pushing from the side? I broke this part trying to get the nut in. Was able to epoxy it in place for now. Printed out a spare and broke it too. I’ll figure it out eventually. One thing, the screw could be replaced with a 12 mm instead of the 10 mm. There’s barely enough threads available on the screw to catch, even when you get the nut pushed in all the way. Since this part isn’t bearing any significant load, and since the extra 2mm wouldn’t get in the way, I’d recommend the change. Maybe it should be mentioned that the extruder cover (B7) contains a design fault?! On the backside where the M3x10 screw for the fan duct goes is a recess for an embeded M3n nut. Under no circumstances insert a nut here! It will spin. In my case i had a bad nut witch made the screw stuck. There was no other way to get them out than chopping parts away from the cover. I will just state that the nozzle-fan screw simply screws into the plastic. I thought I forgot a nut at first because of the comments and the pocket in the back, but the screw certainly goes in tight enough to hold the nozzle-fan without a nut (indeed it took some force just to thread it into the plastic). Echoing Christian and Jared, there is indeed a hexagonal receiver space on the B7 build, implying a nut to hold the M3x10 screw that secures the nozzle fan. I looked through the printed documentation several times to see if I had missed inserting the nut as a step and *thankfully* checked here first. Not sure if the space is an artifact from a deprecated design but it should probably be a) omitted from the print or b) highlighted in the instructions that a nut should *not* be inserted in this space. The nut support in the nozzle-fan-45deg-support is either undersized or had a fault in printing. Out of fear of breaking the part, as others have reported, I put a M3x40 screw through the hole, screwed the nut on the end, heated it with a lighter, and pulled in in about halfway, melting the plastic around the nut. Then I unscrewed the M3x40 after the plastic re-solidified. It still wasn’t in far enough for the M3x18mm screw in the next step, so I used an M3x25mm from the spare parts bag to attach the fan. DItto on this part breaking while drawing in the nut. I was performing the usual drawing in with a bolt process when the part snapped. Welded back together with soldering iron and melted the nut into position. M3x10 is far too short for the nozzle fan 45deg support, M3x15 would’ve been better. I had to drill out the plastic for the M3x10 to catch the nut. There is plenty of room to make the arm that the nut is attached to beefier, then you could put a slot in it and insert one of the M3nS nuts from the side. This would avoid trying to use a screw to pull the hex nut into the opening and cracking the part. We’re confident that the arm is strong enough - if for some reason it fails, it’s mostly due to using too much force. I’m puzzled by the comments above. This step worked fine for me. The nut had already been inserted into the B7 body in a previous step. Pulling the nut into the hex hole in the nozzle fan 45deg support is easy if you place a 3mm/1/8” washer on the M3x10 screw first. I’ve done this previously in all steps that require a nut to be pressed into a hex hole and have no problems. Also, no nut is required to hold the nozzle fan 45deg, as the hole is small enough for the M3 screw to emboss female threads as it goes into the B7 body. Also confused by the comments. This was a super easy step. Maybe the design of the newer ones is more intuitive. Everything matches up perfectly no issue. With reference to bending the filament sensor pins, I used free end of the extruder cable to protect them. Hi Ben, here are the printable parts. Look for the MK3 bundle https://www.prusa3d.com/prusa-i3-printab... or contact our support to get a new one. Using the 18mm screw at first it doesn’t seem long enough. So I temporarily used a 25mm screw to pull the nut up through the support. Then I went back to the correct 18mm and all was well. Hi Ian, well done, this is exactly how this should be solved. If the longer screw is taken from the Spares bag, you can even leave it in. That worked for me as well! The screw head started to go through the hole on the fan, before I noticed it cracked. Maybe small washer to prevent the screw from going inside the fan housing? Hello Mike, thanks for this suggestion, we will discuss this. I had the same problem as Ian Teixeira - October 9 . Solved problem same way. My 45 Deg arm seems to be a little to thick. How far down into the orange pocket does the fan opening sit? My fan barely sits atop the pocket. It is not necessary for the fan in the plastic FAN NOZZLE to be lower. Gently push the fan on the plastic part. I cracked the fan hole too - as Mike St. Vincent above. I have the B7 parts set and there isnt a world in which my M3x18 screw will reach the nut, any solutions? it would need to be a 20mm or 22mm to go through the nut. I eventually got this to work but a little longer screw would have been nice. M3x18 screw was too short for me as well. No way it can reach the nut more than maybe 1 rotation, not enough to properly tighten it. I used a 25mm one from the spare bag but it’s exposed about 4mm out of the printed part reaching close to the stepper motor wires. I think 20mm would be perfect here. I also cracked the support while trying to get the nut to sink deep enough. Either we need a longer screw, so it’s more forgiving, or the hole for the nut needs to be more like the ones for the square nuts that fall out all the time so that there’s no issue getting it into position. As it’s not load bearing I assume that two-part epoxy is a good enough fix? Also snapped my 45• holder :-(. I think that this part it to thin. I was unable to insert the nuts inside so I used a screw by the opposite side to force it in and it broke. I had alignment problems. The fan was about 4mm offset from the 45° arm. Loosening the screw that mounted the arm to the extruder housing allowed me to tighten the fan screw with the arm in the “optimal” position to support the fan in the right place. This is probably the least impressive part of this build so far. Everything else seemed to just fit together. fyi. I also used a 25mm from the spare pack. I also cracked the angled bracket. Glued it and used the 25mm screw. I cannot see that these parts can ever fit together properly. When I slide the orange part on its fixing hole is 3 - 4mm away from the hole on the black support arm. I don’t think I am doing anything wrong - the support arm and fan+orange part form a triangle with the extruder as its base, but the side lengths seem incompatible ! I checked some YouTube videos to see what other people had done and they all seem to be using a different design version that does not have this problem. Is any design revision planned ? OK I take some of it back. I revisited fixing the front print fan after I had the extruder mounted on the X axis. For some reason I managed to attach it this time. I put the orange part on the extruder first and tightened it up. Then I used a 25 mm screw from spares (instead of the 18mm) to connect the fan to the black support arm with plenty of slack. I located the fan in the orange part and then tightened up the 25 mm screw. The fan snapped into place. I think there is a fair amount of tension between the parts, but it worked. I could not get the fit at first but then I loosened the nozzle fan , fit the front print fan and then tightened everything back up. seems like this part could have a little more strength added…. I cracked it but waited until I had the rest of the extruder built and mounted and then removed this piece and used some “Polycarbonate Cement SC-325” to ‘weld’ it back together. I also used the 25mm screw as the 18 was too short making it part of the problem. You can also simply print a new part. this one can be even from PLA. My front print fan stops working. The self test says OK, but during the print stops and printing was paused. Where can I find or order the new one? This one is radial and on the market I could find only axial fan. Does your print fan spin briefly for a second when you boot up the printer? If it does go to Settings > Temperature and set the fan to 255, then go to Support > Extruder Info. Start wiggling the print fan cable and observe if the RPM values drop while you’re doing that - if they do, it means that there is some microdamage in the cable and we can issue a warranty replacement. You can also try disabling Fan Check in settings if the issue is with the RPM sensor wire. If you would like to follow up on this later, please send us an email to info@prusa3d.com or contact us on the livechat, we will look into replacing it. Fan wires = German flag colors. Nice! Please note that the size of that PINDA wire loop is crucial: if it’s too big, you won’t find out until the very end of the assembly (near the end of section 8) when you go to plug the PINDA connector onto the board and it won’t quite reach! Then, like me, you’ll have to tear apart a bunch of work to adjust that loop. Blargh. When zooming the 3rd picture it shows the second picture zoomed. I failed the print fan check on system test because the wire was tucked under the built-in fan clip as shown in the first picture. Not the green circle showing the tuck under the extruder housing clip, but up on the fan housing itself. Tucking the wire there allows the wire to contact the fan blades and stop them—failing the test and other problems. Now that my wires are all tied and tucked elsewhere, I’ve removed them from that little clip and the fan spins fine. Had to use a small flat screwdriver to gently pry open the hole for the sensor so I could squeeze it through. The probe wouldn’t fit without too much force, so I used an 8mm drill bit to SLOWLY drill out the hole. After that the probe fitted nicely and could be easily held down y the M3x10 screw. Consider adding a note to ensure that the pinda and print fan cables are still in the cable clip, as mine easily fell out during step 29, and there are no pictures from that angle. I realized after completing this section of the guide that the cables were laying on the outside. They were fairly tight and weren't touching any components, so I don't think it would have mattered much, but I still removed the zip ties and unscrewed the x-carriage to fix it. The X-carriage’s plastic rod protector/wire holder on the right slot where the motor cable and fan wire is supposed to be held in place broke appart during installation, even though I was very careful. Neural Droid, the same happened to me. I had not even tried to put the wires through the right holder. This is the second piece in this step that broke. x carriages plastic rod protector/wire holder where the motor cable and fan wire is supposed to be held in place is broken off. I dropped it. Can I tape the wires in place until I can print a new x-carriage or should I get a friend to print me a new one? It’s best if you contact our Live Chat and show them pictures - they will be able to assess the damage and tell you if it’s OK to proceed. But I would suggest asking a friend to re-print the part, as it’s much easier than re-assembling everything later. The exploded view which shows the stepper wiring going in a channel “behind” the extruder (along with the fan wiring), needs to be a full size image. I had to disassemble (loosen the screws) to be able to stuff the cables into the channel to clear the belt. I thought it looked odd, which forced me to really review the instructions. I have not yet started with the LCD (where I left of at hour 3, but I have to say that this manual has to be one of the most thorough I have ever read. You can always enlarge the picture, as they are pretty high resolution. It’s important to follow the manual closely - read all the descriptions and check all the pictures. What? No one broke anything on this step? i actually goofed but thinking the previous step was referencing a different cable somewhere else in the kit, but it meant there’s a 5 pin and 4 pin SIDE of the SAME cable. i put the 5 pin in thinking the 5th empty bit was just a consequence of a standardized pin layout or something. didn’t realize my mistake until step 47 when the cover didn’t fit. Thanks for your comment, we are actually already working on a safety-pin solution. The braid of the filament sensor cable is twisted opposite to the braid that I see in the image. Because of this, I assume the clockwise loop should be changed to a counterclockwise loop, in my case. May want to update the instructions to allow for a loop to be made that follows the same braid direction that the sensor cable is in. If I do a clockwise loop, it unbraids the cable and I don’t think that’s what’s supposed to happen. Thank you @philamander, my wires were also twisted the opposite direction. It would be really helpful to shoot a picture from the other side, so we can see the clip on the 4-pin connector and not accidentally use the 5-pin side. Make sure to follow the steps carefully, as the correct end was shown in step 32. I found that the hole wasn’t big enough for the nylon filament and even tapping it with an m3 screw didn’t help. Finally I got a 3mm drill out and very carefully cleared out the hole. After that the filament went in with no issues. Same problem here. It won’t fit. How far did you drill? Make sure you create a pointed tip on the end of the filament. Then as you push the filament in the hole will grab the 3mm filament. If you drill to 3mm it may not hold sufficiently. Stupid question. What is the point of having this filament here? Strengthen the cable bundle? Hi Rick, mainly to prevent to the entire bundle to sag down due its own weight and possibly hit the printed object. Also the nylon as the most stiff element takes majority of the load induced in the bundle. I am not being able to insert the filament. How much should be inserted, like 1cm or it should go through all the extruder? How much should I twist it, like 90 degrees or should I give it a few turns? Make sure to cut the nylon to make it pointy, as shown in the previous step. Roughly 5 mm should do. Twist it with pliers, 45° back and forth, until it doesn’t fall off. Well, mine went in eventually, I hope it stays put. Tough to get this to catch. Probably has to do with the exact shape of the tip. I did clean out the hole a bit with an allen wrench. I found this step a bit confusing. My part we are inserting into here is the newer version, and I’m seeing that the hole that fits the filament is not below the belt passthrough as seen in the pictures here, even with where the belt ends terminate into this piece. There is a larger hole down where the picture shows on my version but that is far to big to hold the filament. A bit confusing due to the upgraded part I think. I got my kit a couple of weeks ago and the hole is in the same place as shown in the photo. There has to be a better way. I finally got mine in. All most had to get some one to hold the head while pushed the wire in. I drilled mine out as well. 1/8” bit (because I’m in the US…) still made for a very snug fit for the 3.5mm filament. Might nominally be 3.0mm, but I measured it at 3.5, and the hole at 3.1mm… which simply did not fit. I ended up using a 1/8 bit as well. I tried to force the filament in with bigger pliers. It simply would not go. It would fall out under it's own weight. After opening the hole with a 1/8 bit, the filament fits perfectly. Good tip (Scott and Brad) about the 1/8” drill bit. I just stuck the drill bit in by hand and got only a few small shavings of material out, which allowed me to put the nylon filament in deep enough to stick. Ok, I'm tired of jerking around with a file and 1/8” drill, by hand, and cutting to make new points. What is it inside that grabs the filament? Is there harm in just more filing? Can I sand down the od of the filament. I got it. The point cut has to be oriented a certain way in the hole. If first try doesn't work, rotate 180 degrees. What will hold it at the other end? Can it sort of float free inside the wrap? Might sound like a silly question but which whole Neede to be used to put filament thru? i mean when using the one in the middle the back ends up to low, using the whole whre all the cbles go thru the back ends up to high. no way This Will fit propperly.what am i doing wrong here. Wetting the sharp cut end of the nylon with rubbing alcohol reduces insertion force. Once the alcohol dries in a few minutes, friction fit grabs firm. I have no idea how this mechanism works, or how to get something stuck in it. A picture of the operating principle is important if you want people to be able to complete this step — what are we even trying to do!? It’s possible it got threaded through some kind of cammed surfaces in the hole… It’s possible it got grabbed by some kind of spring-loaded barbs like an inside-out harpoon… It’s possible the tip got cold-forged into a mushroom-head rivet. It’s possible (though highly unlikely) my frenzied digging friction-welded it to the inside of the hole. I really don’t know. I still have no more idea what happened or how to make it happen after accomplishing it than I did when I started. That said, whatever it is, it’s a neat trick, when it works. Please redesign this! So much force required to get this in risks damaging the cables and other components. Not even sure if this will stay in. Really poor. I tried out someone else’s advice to use a 1/8th inch drillbit. A lot of shavings came out, but then I was able to press fit the nylon filament just fine by hand. I have a fairly recent kit (rec’d last week) and for the life of me couldn’t get the nylon to “stick”. After reading the comments above, I ended up using 6/32 tap on the hole to create threads and then used a 6/32 nut chucked in a variable speed drill at very low speed to cut threads in the nylon (don’t have any dies). The nylon then simply threaded into the mount. Funny thing is the nylon “screwed” in perfectly with no mods into the higher hole in the mount, which of course after I tried to route the cables I realized was the wrong one! I think an M 3.5 tap and nut would also have worked too, but I didn’t have that size nut in my metric collection. Thanks Stuart! I followed your lead and it worked great. Guys, try making the end of the nylon sharp. I did that after having trouble and coming here and it worked the 2nd time I tried to insert it. Twisted it 45 degrees, back and forth, while pushing it in and holding the extruder with my other hand. Don’t bother trying to stick the nylon into the hole, just line the end of the nylon up with the length of the cable bridge and cable tie it down with the other cables, this solution will provide plenty of support for the cables. After reading the comments, I decided to whittle mine into a concentric point with a knife, vise grips choked up all the way, and a heart-felt push. It worked first try. After trying several different methods, I noticed that one end of our 50cm nylon “filament” was considerably thicker than the other. Turning it around allowed me to push it in by hand with no drama. Vice grips and brute force. Thanks - the vice grips worked for me. So, seriously, we just had the panel off the back side and you can’t figure out a way to feed it through and be held captive as the extruder body and carriage are brought together? Jut have enough space to push it through, kink it 90 degrees and have it captured. Is the curve of the filament supposed to be up or down? The curve doesn’t matter, you can orient it in any way it’s easier for you. Similarly to a lot of you i also had issues with this step. However i was able to successfully insert the filament using a variety of the tips posted in this comments section. 1. Check both ends of the filament. As Scott Sullivan discovered mine was also thicker at one end. 2. Cut the thiner end of the filament to create a tip. 3. Using the smallest allen key measure the depth of the hole (i believe its approximately 15mm) and mark your filament cable so you know how far you need to insert it. Credit to Peter Herz for this step. 4. Grip the filament with pliers about 15mm from your mark and insert it onto the hole while securing the extruder with your other hand. I had the tip of the filament at the bottom of the hole, i’m not sure if that made a difference. 5. Twist the filament with a series of clockwise and counter clockwise turns (each turn was roughly 45 degrees) until you reach the maker on your filament. Thanks to Bill the Cat for this step. 6. Pull the filament to make sure its seated correctly. I was confused so I read these messages and steeled myself for an epic battle. It went in easily with firm hand pressure, I rotated it until it stopped, and it stayed. On to step #36. Why not have a threaded ‘hole’, with a slot cut along its length where the nylon will fit, then when a bold is inserted into the ‘hole’ and tightened the nylon is gripped? Hello Hugh, that would be unnecessarily complicated, imho. Just follow the instructions word-by-word (hold the part and twist the nylon into the hole) and everything’s gonna be alright. When I cut an angle on the end of the filament, as instructed, it prevented the filament from going deep enough for the hole to bite onto it. I cut the end square, gripped the filament with the pliers and then gently pushed it in. It worked great. I tugged on it with a decent amount of force and it stayed put. Did this stap between stap 29 and stap 30, much easier and no frustration. Just a thought; considering how often this procedure of drawing the nut into the printed part using a screw is used, but this is the first time in the manual it is explicitly shown, it may be helpful to place the procedure as one of the first orientations in the manual. Right?! Here I am, probably 4 hours into the build, and this is the first time I’m seeing this procedure? I did it in all the other cases, but this is just odd to see it all the way on this step and not in the very beginning. I wouldn’t even bother telling people to do it any other way. Just do it this way every single time and save some headache. Double check the x-belt tension NOW before attaching the X-carriage back. Once this back is in place, you cannot shift the x-belt to a different tooth position without undoing a lot of wire securing work . The x-motor tensioning adjustment mechanism has a very limited range of motion (about one belt tooth position). So, get your x-belt teeth in position with good tension now.. There is a an alternative X-carriage back design on Thingiverse that splits the X-carriage into a top & bottom section. That allow s access to the x-belt without undoing the entire extruder wire securing system. Of course, that alternative design cover doesn’t do any good until you have assembled the printer. I had to shorten this part, to long but no problem, not an essential part. Which part exactly did you shorten? Did you make sure to put the screw in the correct hole? There also could be some extra material printed inside that may need to be cleaned. If you have cut off the plastic part, please check later if your zip ties aren’t hitting the printed EINSY case or the PSU and readjust accordingly - it may cause your XYZ calibration and selftest to fail. Hi Neil, the logo should be there, I will discuss this with my colleagues. Mine has the logo, but it's barely visible. It looks like the part was printed on the textured bed, which might be why the logo is so hard to see. Same thought here. Logo looks to be lost in the texture. As long as the part looks exactly like the one on the photo, it’s not a problem that the logo is not there /not clearly visible. Terminology from the letterpress printing industry - Embossed is a raised image while debossed is a sunken image. Back to jerking around in a previous step. Whittle into concentric sharp point. Make sure not to over tighten the screws at this point. Mine snapped without being too tight and are not covered under warranty :( A side on picture would be helpful to show proper alignment of the two pieces with each other and the bearings. You will find out many steps from now that it’s important for the wires to be tucked completely into the slot and not protruding. If the wires protrude at all they can catch the filament holder when the print head is all the way up. The clearance between the back of this print head where the wires are, and the frame (which the filament holder mounts to) is only a couple of mm. Make sure the wires are neatly and completely tucked into the slot. How important is the middle screw after alignment? The screws on the 4 corners grabbed and tightened down however the middle screw doesn’t grab at all. The screw is fully inserted but just spins and it pulls right out with no resistance. I have confirmed the X-carriage-back is flush so I don’t know if I should look to size up the screw a bit so the teeth bite or not. Every screw should be tightened. If you can’t tighten the middle screw, then it means you forgot to insert one of the square nuts. There’s one nut inserted waaay back in the step 3.11 (X-axis) that could easily fall out :( Maybe it’s the one. The good news is if you had that square nut fall out somewhere along the way you don’t have to disassemble anything to install it. Just use the needle nose to grab it and slide it in carefully. My upper two corner M3x10 screws don’t quite reach their nuts even though the parts are pressed fit together. By placing a screw on top of the part, I can see that the tip of the screws only reach into a fraction of the nut width. Can I replace the M3x10 with a longer screw? How much headroom is there? I could fix this by cleaning up the irregularities in the plastics beneath the screw heads using a 6 mm wood drill which I turned by hand. Then the screws grabbed their nuts. I added a small bead of hot glue to the channel for the filament sensor cable. Not really necessary, but I liked the look and it will be easy enough to remove if needed. Hey Frank, there is absolutely no reason to add the glue there. Does the X carriage back need to sit flush against the extruder? All of my screws are in place, cables all seem to be in place but it just doesn’t look happy. Hello, yes it is supposed to sit flush, you might want to check the cable management in between those parts. The top two were really hard for me. I had to use an M3x18 on the top right, tighten it down then i was able to get the M3x10 to grab the nut. Make sure you didn’t make the PINDA loop too big. The cable will be too short to hook to the circuit board. I had to go back, but in doing so I got a much better result with the textile sleeve. In addition to this, it is worth noting that if any of the extruder cables (including PINDA) is sticking too far out to the side, it may obstruct X carriage movement, which can later cause issues during XYZ calibration. Thanks Bill, definitely don't want to walk back and redo this step. I adjusted the top of my pinda loop to be just below the Extruder-idler door. Figured moving the pinda loop out of the way to deal with jams would get annoying fast. Thanks for the comments - I checked my PINDA loop and found it needed to be adjusted. MUCH easier now than later ;-). FYI - I am at roughly 3.5 hours up to and including this step - pretty close now, maybe another 30 minutes based on what I see coming up. I did have maybe 15 minutes of rework based on my own mistakes. Get the heads of your zip ties exactly in the positions illustrated. Also remove the zip ties that came already on the hot end cables. Otherwise, the zip tie heads impinge against the frame and cause an x-axis length error. Check the hot end temperature sensor lead to prevent a thermal sensor wire failure that may occur after a few weeks of printer usage if the shrink wrap is in the wrong position. The plug end of that wire has a yellow/green shrink wrap. Ensure there is at least 5 mm of free wire between the plug body and the shrink wrap’s end. If the yellow/green shrink wrap ends too close to the plug, it acts as a rigid lever gradually pulling the wires out of their crimps once the EINSY door is closed. The wire crimps can fail a few weeks if under tension. Use sharp tipped scissors to carefully trim the shrink wrap back leaving adequate free wire to flex between the shrink wrap and the plug. Don’t cut the actual wires, though! I have two pieces, they look virtually identical but not completely. Is one a spare? I have two also? Both are 4mm by 12.8mm, but one has a much more pronounced cone on the inside ends. I am missing the PTFE tube as well. I have gone through all the bags, rechecked my workspace. There was one on the hotend, but not a separate one for the sensor cover. I have contacted support and am having one sent out. the connector on the filament sensor wire, have 4 wires, but is inserted into an plug for 5, so there are one free on the top, and that one extends a bit, so the filament cover does not fit. ok, that was me putting the sensor wire wrong way around..
Nah I would agree 5pin holder on the sensor cable with 4 pins connected orientation change will give you incorrect wiring and won’t make any difference still won’t fit. Amazed this has got through Prusa quality control you simply cannot fit the filament cover like this. I’m gong to see if I have a 4 way holder in my spares I can wire into. Guys don’t be a dufas like me! Reporting back as when I got towards the end of the build (plugging cables in) realised my stupid mistake, I actually had this cable the wrong way around. The end with the clip catch thing oddly goes on the sensor not the board. I ended up hacking the connector housing for it to fit at both ends. By the time I realised my error it was too much work to un-embed the cable. not sure what purpose this step serves. Hi Trent! If you look at the extruder from the right side, there is a hole in the Extruder Body that leads to the filament sensor. The idler plug is there to seal this hole, to prevent light from reaching the filament sensor. “Assemble the …”, you mean, just drop it in place? What is the hold it in place? Yeah, nothing will hold it in place but friction. It needs to be removable because that is right about the door that you’ll open/close to give you access to the extruder gear, if you ever need to clean it. When you need to access it, you just pull that plug off and open the door. Then replace it when you close the door so it can seal off the light and the filament sensor inside can work properly. this piece fits so loose I am worried it might fall out into a print. I think a lot of parts, not just here but everywhere, the infill is not appropriate. For example, my pinda sensor holder isn’t very sturdy and flexes easily. I was doing some maintenance, and noticed the screws from step 15 were very loose. I may have overtightned slightly as I head some slightly unpleasant grinding and backed off. It’s counterintuitive for screws to be so lose on install, but I believe these screws loosen more over time as you print, even after only a week. My screws were sticking out and totally lose after 7 days of printing. Y axis motor mount is horrible. It cracked along a seam on install, luckily I was able to print a higher infill reinforced replacement before it lost more tolerance. My Rambo board cover lower pin also snapped. My suggestion is raise infill % overall for all parts, and maybe make step 15 less heavy maintaince involved since screws loosen over a very short period of time and just “tightening everything” is pretty dangerous, especially for step 15 screws. Maybe you could redesign how these parts fit to make it more intuitive/less prone to any risks of damage. A maintenance guide for common loose screws etc might be useful, could include some info regarding rail, leadscrew, and bearing oil/grease also since after reading there isn’t any official stance regarding lubricants. Maybe also improve the PSU’s, since mine failed after 7 days. Maybe newer ones already better, my replacement seems to get less hot and slightly quieter. Hoping for the best with it! The little angle bracket that holds the tilted fan broke while I was inserting the nut using a screw from the other side. It only cracked one side, so I just went on, but might eventually reprint it or at least superglue the crack. I didn’t have serious trouble with any of the other nut insertions, and wasn’t being rough with it as far as I can tell. What kind of plastic are these parts? All of our parts are PETG, except the fan shroud (fan nozzle), which is ABS. If you don’t have PETG, this particular part will do just fine even if you print it from PLA. Suggestion: Add more Haribo breaks in this section. Involved sequence of steps to be sure, but at this point, the hard part is mostly over! How about a photo from the opposite side also. thanks for this suggestion, we will discuss this. How do I know which version I have. I do not know if it is Ver. B7 vs. any other version. Parts with angled fan are the B7/R3 version. Glad I made to here. Fun, but it seems like there are a lot of parts that are unnecessary. The hologram just magically appeared on the extruder motor in the last step. I built one of these last year and couldn’t figure out what the hologram sticker was for left over in the box. This time I was paying closer attention and realized it’s for the extruder motor and should be added on step 50. You need to add an actual step that mentions the hologram being affixed to the extruder motor. Hello Gaijin! You don’t need to worry about the sticker. We receive it with the E3D hotends so we just stick it randomly on any side of the motor cause there is no other place to stick it on. The sticker does not have any meaning or importance. Obviously the sticker logo means something… but what? The idler-plug that we installed in the previous step is missing from this picture, so it may cause confusion. I suggest you add the idler-plug to the picture of this final step. Also took me 3 hours. Burned them. Black tape works as well. Step 5 “Slide the shaft through the idler and pulley” was such a difficult thing to complete without breaking the Extruder-idler. The tolerances of the shaft hole loops are not that strong in the the orientation that the Extruder-idler is printed. Broke the part, and had to have someone print me the part out of black PTEG to continue the steps. They printed me two replacement parts in-case I broke one again. Well, yes I broke the first one (shaft hole snapped again). With the second replacement part, I took a drill and made the hole a little bigger. Both the part which came with the set, and the parts that were re-printed had the same hole diameters of 2.67mm, while the shaft is 3mm. In order to not break the last replacement part, I took a drill and a 3mm bit and made the holes bigger before inserting the shaft and finally got step 5 assembled. What is the idler plug used for? It’s just sitting there on the screw, and I’m sure it’s going to fly away at some point. It is there to prevent too much light from reaching the filament sensor. You have to be careful about it when opening the idler door. About 3 hours to complete. It would be handy at the end of the web page to have a link to the next set of steps. Spent about 8-9 hours assembling the kit. Had fun! Didnt like the adjustment of belts..
3-4 hours due to some issues, such as Step 26 (part 2), and Step 35 (both of which were a pain). Other than that, decent and time consuming but good accomplishment. I would suggest to permute step 4 and step 5 to avoid keeping the nuts falling while trying to insert the shaft into the printed part. The nuts are only needed for step 16 I think. Step 5 has been by far the most difficult step of the whole printer assembly, as the shaft does not insert easily into the printed part. The shaft seems to be a bit short by the way, and this does not help to insert and position it. It helped a lot to use a small plastic-ended hammer, with a feeler gauge inserted between the pulley and the printed part to avoid breaking it down. Bonjour, merci pour vos remarques. En ce qui concerne l’ordre des étapes, c’est pour éviter que vous perdiez les écrous en manipulant avec la pièce. Sinon merci de nous avertir de la qualité des pièces imprimées, je vais passer le message à mes suppérieurs.